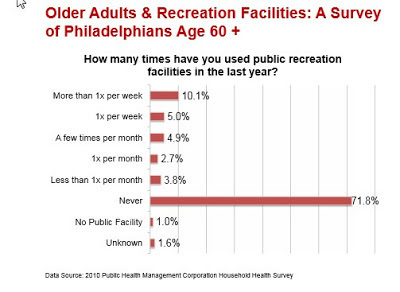 Several cities have surveyed park usage by seniors and found it wanting. Given the sparse usage of parks by seniors this seems to indicate there are many parks systems are not meeting the needs of older people. 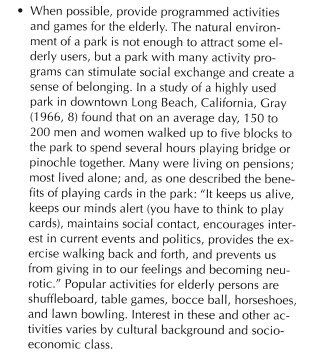 ..
A Rand Corporation study found that seniors seldom use Los Angeles parks. 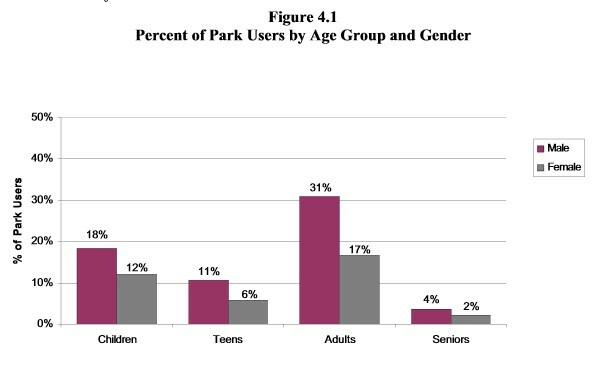 ▶ Central Park and Riverside Park are tremendous assets to older adults. Many older adults would like to visit the parks more often, but find it difficult because the parks are too far away from where they live, too difficult to enter or not comfortable once there. ▷ Older adults ask that more green space (e.g., trees and gardens with benches) be created closer to where they live. ▷ Older adults said that the lack of open public restrooms makes visiting parks difficult. The benches created along Broadway’s medians are a tremendous asset to older adults in allowing them both to rest so they can travel further and to have a free place to sit alone or socialize. ▶ They care about benches, trees, gardens and open space closest to where they live. Big parks are for occasional visits in most cases. ▶ Benches are very important for them to be able to walk farther distances and to be able to be outside near their homes. The lack of public restrooms keeps many people from traveling too far from home. Many knew of one or two specific places where they often stop and use a bathroom. 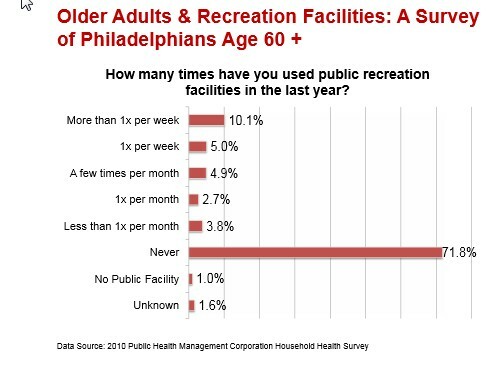 ▶ Very few older adults use public pools, but many said they would if there was a special hour for older adults. ▶ Almost everyone we spoke to said they have almost no disposable income. If they have any, they like to play the lottery, go to Atlantic City, buy gifts for others, and eat out or buy prepared food. ▶ People tend to do free things like visiting parks, walking, reading the newspaper, doing tai chi or playing dominoes, mahjong, ping pong.